TornadoFX&apos;s type-safe builders provide a fast, easy, and declarative way to construct UI&apos;s. This DSL approach is encouraged because it is more flexible, reliable, and simpler. However, JavaFX also supports an XML-based structure called FXML that can also build a UI layout. TornadoFX has tools to streamline FXML usage for those that need it. If you are unfamiliar with FXML and are perfectly happy with type-safe builders, please feel free to skip this chapter. If you need to work with FXML or feel you should learn it, please read on. You can also take a look at the official FXML documentation to learn more. While the developers of TornadoFX strongly encourage using type-safe builders, there are situations and factors that might cause you to consider using FXML. With FXML it is easy to separate your UI logic code from the UI layout code. This separation is just as achievable with type-safe builders by utilizing MVP or other separation pattern. But some programmers find FXML forces them to maintain this separation and prefer it for that reason. FXML files also can be edited and processed by Scene Builder, a visual layout tool that allows building interfaces via drag-and-drop functionality. Edits in Scene Builder are immediately rendered in a WYSIWYG ("What You See is What You Get") pane next to the editor. If you prefer making interfaces via drag-and-drop, or have trouble building UI&apos;s with pure code, you might consider using FXML simply to leverage Scene Builder. The Scene Builder tool was created by Oracle/Sun but is now maintained by Gluon, an innovative company that invests heavily in JavaFX technology, especially for the mobile market. If you are converting an existing JavaFX application to TornadoFX, there is a strong chance your UI was constructed with FXML. If you hesitate to transition legacy FXML to TornadoFX buidlers, or would like to put that off as long as possible, TornadoFX can at least streamline the processing of FXML. The root property of a View represents the top level Node containing a hierarchy of children Nodes, which makes up the user interface. When you work with FXML, you do not instantiate this root node directly, but instead ask TornadoFX to load it from a corresponding FXML file. By default, TornadoFX will look for a file with the same name as your view with the .fxml file ending in the same package as your View class. You can also override the FXML location with a parameter if you want to put all your FXML files in a single folder or organize them some other way that does not directly correspond to your View location. Let&apos;s create a basic user interface that presents a Label and a Button. We will add functionality to this view so when the Button is clicked, the Label will update its text with the number of times the Button has been clicked. You may notice above you have to import the types you use in FXML just like coding in Java or Kotlin. Intellij IDEA should have a plugin to support using ALT+ENTER to generate the import statements. If you load this file in Scene Builder you will see the following result (Figure 9.1). Next let&apos;s load this FXML into TornadoFX. Note that the root property is defined by the fxml() delegate. The fxml() delegate takes care of loading the corresponding CounterView.fxml into the root property. If we placed CounterView.fxml in a different location (such as /views/) that is different than where the CounterView file resides, we would add a parameter. Since the FXML file automatically gets bound to our View, we can reference functions via the #functionName syntax. Note that we do not add parenthesis to the function call, and you cannot pass parameters directly. You can however add a parameter of type javafx.event.ActionEvent to the increment function if you want inspect the source Node of the action or check what kind of action triggered the button. For this example we do not need it, so we leave the increment function without parameters. By default, build tools like Maven and Gradle will ignore any extra resources you put into your source root folders, so if you put your FXML files there they won&apos;t be available at runtime unless you specifically tell your build tool to include them. This could still be problematic because IDEA might not pick up your custom resource location from the build file, once again resulting in failure at runtime. For that resource, we recommend that you place your FXML files in src/main/resources and either follow the same folder structure as your packages, or put them all in a views folder or similar. The latter requires you to add the FXML location parameter to the fxml delegate, and might be messy if you have a large number of Views, so going with the default is a good idea. 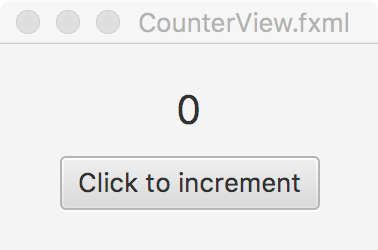 Using just FXML, we have wired the Button to call increment() every time it is called. We still need to bind the counter value to the text property of the Label. To do this, we need an identifier for the Label, so in our FXML file we add the fx:id attribute to it. Our app is now complete. Every time the button is clicked, the label will increment its count. JavaFX has strong support for multi-language UI&apos;s. To support internationalization in FXML, you normally have to register a resource bundle with the FXMLLoader and it will in return replace instances of resource names with their locale-specific value. A resource name is the key in the resource bundle prepended with %. TornadoFX makes this easier by supporting a convention for resource bundles: Create a resource bundle with the same base name as your View, and it will be automatically loaded, both for use programatically within the View and from the FXML file. If you want to support multiple languages, create a file with the same base name followed by an underscore, and then the language code. For instance, to support French create the file CounterView_fr.properties. The closest geographical match to the current locale will be used. Now we swap the button text with the resource key in the FXML file. If you want to test this functionality and force a different Locale, regardless which one you are currently in, override it by assigning FX.local when your App class is initialized. 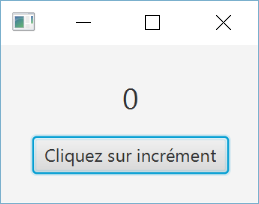 You should then see your Button use the French text (Figure 9.2). Internationalization is not limited for use with FXML. You can also use it with type-safe builders. Set up your .properties files as specified before. But instead of using an embedded %clickToIncrement text in an FXML file, use the messages accessor to look up the value in the ResourceBundle. Pass this value as the text for the Button. FXML is helpful to know as a JavaFX developer, but it is definitely not required if you are content with TornadoFX type-safe builders and do not have any existing JavaFX applications to maintain. Type-safe builders have the benefit of using pure Kotlin, allowing you to code anything you want right within the structure declarations. FXML&apos;s benefits are primarily separation of concerns between UI and functionality, but even that can be accomplished with type-safe builders. It also can be built via drag-and-drop through the Scene Builder tool, which may be preferable for those who struggle to build UI&apos;s any other way.